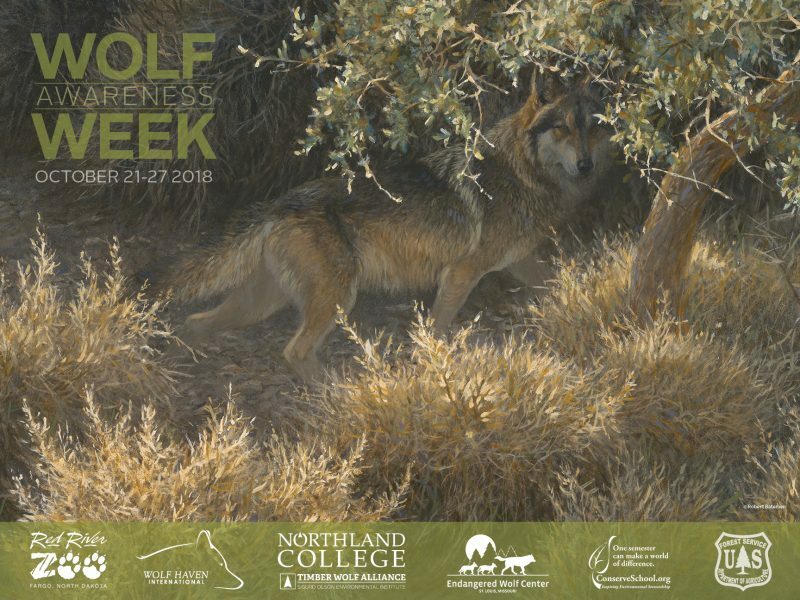 To commemorate Wolf Awareness Week, TWA creates an annual poster featuring an award-winning artist’s rendering of a wolf or wolves in their natural habitat. Below you can learn more about ordering posters, submitting artwork for next year’s poster, and becoming a sponsor. TWA offers several levels of support to individuals, organizations, and agencies. Over 10,000 Wolf Awareness Week posters are distributed around the country to raise awareness of wolves and the fragile environment in which they live. Your sponsorship helps the Timber Wolf Alliance educate communities about wolves. Please join us as a sponsor of the next poster. Poster sponsorship deadline is June 2019. Each year Wolf Awareness Week and its poster celebrates a broad theme in wolf conservation. Thus in 2019 we would like to celebrate Ma’iingan’s relationship with the Ojibwe as well as other Native American cultures within North America. In 2018 we celebrated the twenty-year anniversary of Mexican Gray Wolf reintroduction and recovery, and in 2017 we celebrated the thirty-year anniversary of Timber Wolf Alliance providing wolf-related education throughout Wisconsin and Upper Michigan. Wolf Awareness Week posters have been created by Timber Wolf Alliance since 1990. Gichi Manito (Great Spirit) put Anishinaabe (Original Man or Winaboozhoo) down on the earth to name all the plants and animals. Anishinaabe, he noticed all the animals came in twos, yet he was all alone! So Gichi Manito listened, and sent someone down, the wolf, to be a companion to Anishinaabe as he traveled around, with wolf keeping him company, naming and learning about all the plants and animals. Gichi Manito told Anishinaabe and wolf that they would be like brothers, to visit all the places on the earth… which the two of them did, and through their long travels they did become close like brothers and also realized that they were like brothers as well to all the other plants and animals and depended on them. Ideally, we seek art that displays wolves in of the Great Lakes states ecosystems. However, we are grateful for any wolf art submissions. Please submit proposed art work with entry form by April 15, 2019, to soei@northland.edu.